ITANAGAR, Feb 7: The Arunachal Pradesh Congress Committee (APCC) on Thursday said it is going to go ahead with its protest rally during Prime Minister Narendra Modi’s visit to the state capital on 9 February to draw his attention towards the citizenship amendment bill (CAB). Modi is scheduled to visit the state to inaugurate and lay the foundation stones of important projects in the state, including the greenfield airport and the National Film and Television Institute. 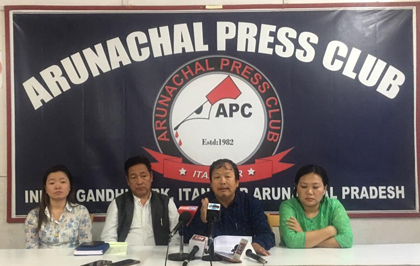 Addressing reporters at the press club here, APCC general secretary Chera Taya said the Congress is not against the visit of the prime minister, but is disappointed that the “anti-Northeast” and “draconian bill” is being brought under Modi’s leadership. He also took a swipe at Modi, using the word ‘jumla’, which has been brought into wide circulation courtesy of BJP national president Amit Shah. “Jumla raja apna shankh bajane aa raha hai (The king of empty promises is coming to blow his conch),” Taya said. “When he (Modi) had come to inaugurate the railway station here, he had called his own government (under Pema Khandu) a bucket with a hole. He knows it is election time now and is coming here to spread his gimmick. Instead of taking us towards better days, we are being taken into darkness. The Northeast, including Arunachal, is going to be a dumping ground if the CAB is passed in the Rajya Sabha,” Taya said. The APCC commended National People’s Party (NPP) president Conrad Sangma for standing up against the bill, and informed that the Peoples’ Party of Arunachal (PPA) has also expressed its willingness to take up the cause. On whether the NPP and the PPA will participate in the APCC-sponsored rally on 9 February, Taya said he could not speak on behalf of the other parties. APCC spokesperson Toko Mina appealed to Chief Minister Pema Khandu also to join the rally. “He is a part of Arunachal Pradesh and the Northeast. I do not understand why he is maintaining silence as if it is not going to affect him. The CAB will affect not only him but his future generations, as well,” she said. Mina also called out on Rijiju’s silence on the issue. “Rijiju has the most power and status at the moment, and it becomes his duty to raise his voice and work for the public. Arunachal is burning and he is not uttering a single word,” she said. As to whether Congress MPs Ninong Ering (Lok Sabha) and Mukut Mithi (Rajya Sabha) will participate in the rally, the APCC said they will if they are in town during the time.